Posted 8:15 pm by Rena Anya Devéza & filed under Alexander Technique, Alexander Technique Teacher Training. “When you come to a fork in the road, take it.” So goes the famous Yogi Berra saying. It seems that I have come to a fork in the road. Should I take it? I am supposed to start Alexander Technique teacher training again but this time around in a spanking new training course. It is to meet during hours that are great for me…primarily in the evenings…thus permitting me to work my normal schedule while I am undertaking my training. Just as I was feeling tentative about returning to work, after having had to take over two months off for my knee surgery and recovery, well, I am having cold feet about starting to train again. After all, the last time I trained was back in June. That’s quite a hiatus. The scaredy cat feeling at work didn’t even last a day. But before that moment, I didn’t want to return, talk with anyone from work, message anyone at work. I felt like I was thinking that I would feel like a stranger when I returned; like I was starting a new job. I am feeling exactly the same way about returning to training. I am hoping that my cold training feet will last not even one class. But right now I am harboring dark thoughts of fleeing in the opposite direction. Even take a time out from lessons. I want to pretend that I never even heard of the Alexander Technique. I am going through my stuff, right? After all, training to be a certified AmSAT teacher is a huge commitment in time, energy and funds. “Is it worth it?” I keep asking myself. Do I really want to do this? As I know oh so well the answer (yes it is!!!) obviously I’m obsessing and getting worked up for nothing. Such a waste of energy, no? Time to inhibit and redirect (in Alexander terms) right? I will try not to fret. 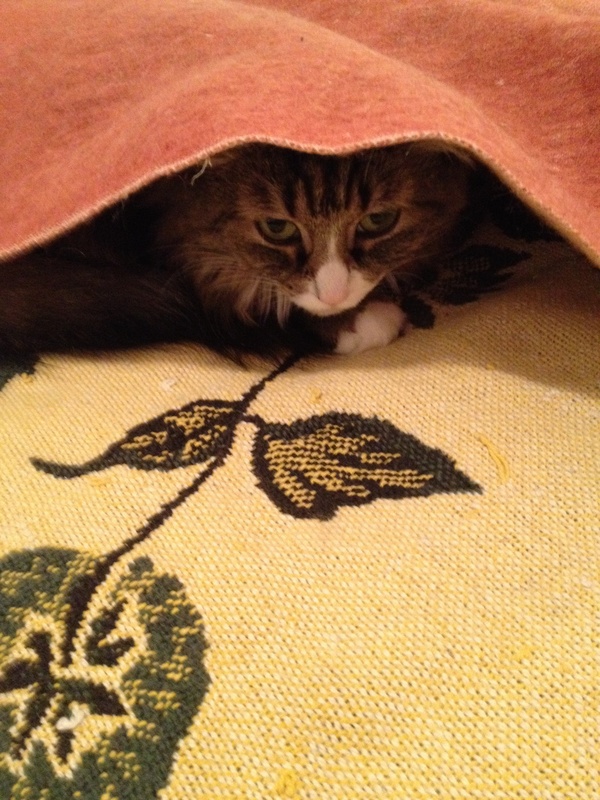 I’m kinda feeling like Doucette the cat has the right idea! Being at work now is my panacea against this agita. I’m just thrilled to be able to go to work! It represents sort of a safe haven for me. I just want to tune out the preoccupations of my life while being with my amazing co-workers. One thing though…all my colleagues keep asking me when I’m going to start training again. It seems that I cannot escape. Well…you know of course that I will bite the bullet. 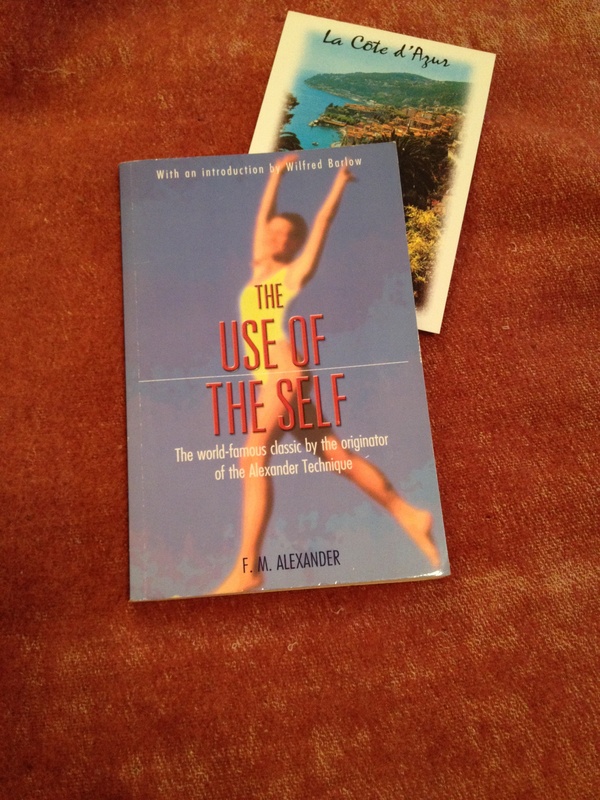 Rumor has it that the first reading we will undertake will be FM Alexander’s third book The Use of the Self. I read this book when I first started taking lessons. So no biggie here. It will be fun to re-read it. I have gotten my copy down from the shelf, and I have found a nice postcard from La Côte d’Azur, sent to me years ago, to use as a bookmark. Oh and I scheduled in a last lesson before training starts!